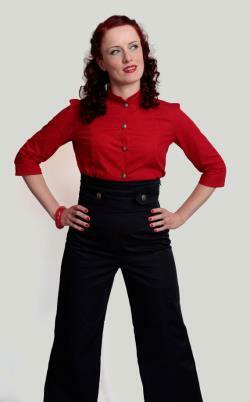 These trousers feature a super extreme high waist band with half-belt and anchor button detail. The legs are cute very wide all the way down. A very flattering shape for any body type. The trousers will be made to order, please see sizing guide below for details. Measure carefully, the trousers are not stretchy. If you need a guide on how to take your measurements, message me. You have the choice of black, navy or red cotton drill and either silver or gold anchor buttons. Please let me know what colour buttons you like in a message with the order as well as the length you require. These trousers are a must have staple item in any vintage wardrobe. S (b 34, w28, h37). M(b 36, w30, h39). L (b 38, w32, h41). All measurements are in inches. It's also insured in case of any loss or damage. If you would like a cheaper option, let me know and i will give you other options, however i can't be responsible for any loss or damage along the way. 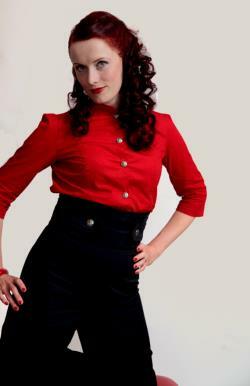 These trousers are part of my wardrobe staples collection and a great addition to any pin up collection. Please see my other listings for more pieces from the collection and cute accessories to finish off the look.